GDC 2006: The waiting is over. From today, gamers will finally be able to order desktop systems equipped with the much anticipated PhysX processor (PPU) from AGEIA - the first hardware accelerator chip for physics. Alienware, Dell and Falcon Northwest are the announced launch partners and others will follow. We were fortunate enough to receive a private demo from Alienware, where we learned that AGEIA PhysX PCI cards will be available in selected Alienware desktop systems, inlcuding Area-51 7500, Aurora 7500 and ALX systems. Pricing will vary according to specification - configure a system at Alienware.com and systems should ship next week. The general system specs are not for the faint-hearted: AMD Athlon FX-60 processor, NVIDIA GeForce 7900 GTX SLI, low latency DDR memory, Creative X-Fi audio. These systems represent the pinnacle of PC gaming performance available today, an ethos supported by the addition of the PhysX card. However, anyone hoping that the prescence of a PPU to accelerate physics will somehow alleviate the need for high-end components elsewhere is in for a shock. While the PPU handles the physics calculations for the thousands of extra particles and objects in a scene, the GPU now needs to draw the additional polygons and handle the increased texturing / shading load. The systems shown to us were pitched as 'future-proofed' in that they featured hardware today that tomorrow's games would require. Unfortunately for the sales teams at Alienware and AGEIA, the software side of things has lagged behind the hardware. We were told there are over 60 developers working on 100+ titles featuring PhysX support, but should you order an Alienware, Dell or Falcon Northwest system today, your gameplaying options are somewhat limited. City of Villains will be patched, as will Bet on Soldier but the first new games to feature PPU support out of the box - Tom Clancy’s Ghost Recon Advanced Warfighter and Rise of Nations: Rise of Legends - won't arrive until May. The one game that could seriously drive sales - the Unreal Engine 3.0-power Unreal Tournament 2007 is not expected until Q4 2006. It's still early days for AGEIA. The technology is great, and the potential for mind-blowing physics-driven gameplay is there, just as it was when we last saw it three months ago at CES. What they need now is killer titles that make PPUs the must-have hardware item of 2006 and for that, we may have to wait a few more months. 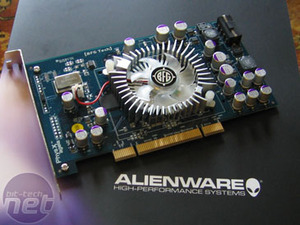 Inside the Alienware: the ASUS A8N SLI has three PCI slots, so no problems accomodating the PPU card. 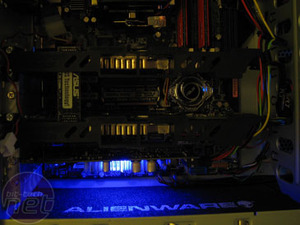 Dual-slot coolers on other motherboards may cause conflicts (note - GeForce 7800 GTX SLI pictured). Cards will be produced by ASUS and BFG Technologies. Are you going to be checking out the PhysX for your own rig? Let us know your thoughts over in the forums.